Ex-Tottenham striker Garth Crooks has called on players in the Italian league to strike this weekend unless Sulley Muntari's one-match suspension is withdrawn. 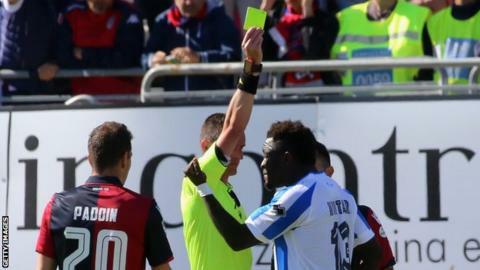 Pescara midfielder Muntari, 32, was banned after he protested against racist abuse he received from the crowd during Sunday's Serie A match at Cagliari, which earned him a yellow card for dissent before he walked off. Italy's football chiefs were branded "gutless" by anti-discrimination organisation Kick It Out. "Those with power in Italy need to take action to stop this happening again," Kick It Out tweeted. Crooks, an independent Kick It Out trustee, told the BBC: "I'm calling on players in Italy, black and white, to make it absolutely clear to the federation in Italy that their position is unacceptable, and if the decision is not reversed then they withdraw their services until it is." In a fuller statement on its website, Kick It Out added: "It's unbelievable that Cagliari escaped punishment as 'only 10' fans were involved. This situation should never be allowed to happen again." Ex-Ghana international Muntari was cautioned for dissent after asking the referee to stop the match, and then walked off in protest - which earned him a second yellow card for leaving the field of play without permission. The Serie A disciplinary committee which issued Muntari's ban agreed that the fans' actions were "deplorable" but said its guidelines meant it could not impose sanctions as only "approximately 10" supporters were involved - fewer than 1% of the Cagliari supporters in the ground. Pescara's coach Zdenek Zeman's said that he hopes "mentalities will change" with respect to racism. Crooks added: "This is not just about black players, we've moved on from that. This is about players. "And I'm also a little alarmed that Sulley Muntari's team-mates have not become involved in this. His manager's not said more - he said something but quite frankly what he has said is rather inadequate as far as I'm concerned. "So it's about addressing racism together as black players and white players, because that's the only way we're going to get past this problem in football." World players' union Fifpro believes Crooks' call for a strike might be difficult to implement but agrees action is needed. Spokesperson Andrew Orsatti told BBC World Service that the committee's decision was "appalling, outrageous and poorly managed". He added: "The message had to be about racism and stamping it out and sending a clear message that Muntari's cry for help was heard. But they failed on both counts, the Italian authorities, and the mind boggles as to how that occurred."